Copyright © Island Dreams, Inc. All rights reserved. 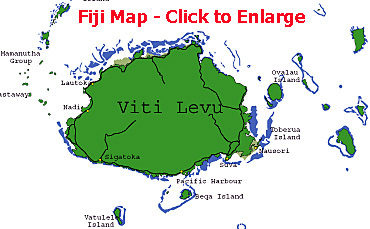 THE FIJIAN ISLANDS - People visualize Fiji as an island paradise... beautifully tropical and romantic with a wide range of upscale lodging choices waiting to pamper you during your sojourn. 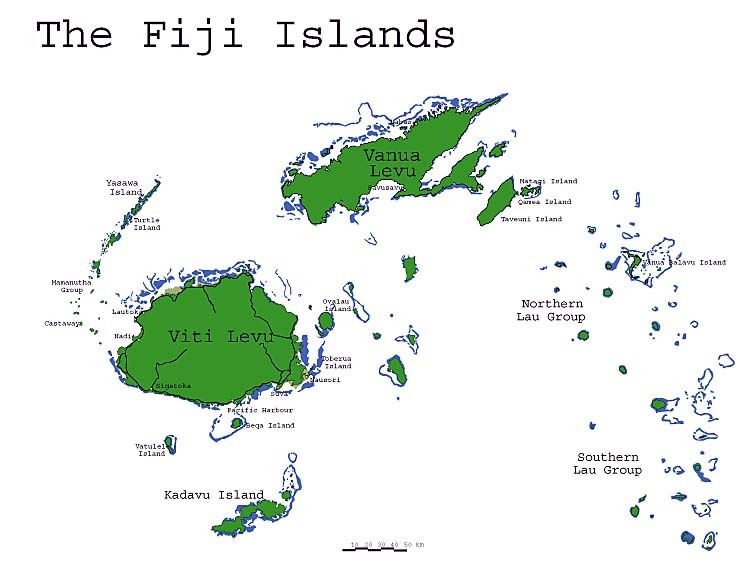 However, most don't realize that Fiji consists of more than 300 islands and only about 1/3 of them are inhabited. Each island is unique in its culture, topography, and of course the part we love... the scuba diving. My previous trip was aboard a live-aboard dive boat, the Fiji Aggressor, and that was very enjoyable. As this was a repeat visit to Fiji, I tried to cover some new territory, visiting as many land-based resorts as possible, and had a great time once again. Read on for more details. GETTING THERE - Air Pacific offers a comfortable ride on their 10-½ hour, non-stop flight from Los Angeles to Fiji. Nadi (pronounced "nandy") is the international arrival point for all Fiji visitors. My first stop was a day room at the Tokatoka Hotel for a shower and refreshing nap. By 9:00 a.m., I was ready to continue on my local Sun Air flight to the island of Kadavu. My arrival on Kadavu, and their small paved island airstrip, suddenly brought me into the tropics. KADAVU ISLAND - Kadavu is the 4th largest island in Fiji located about 50 miles south of Suva. 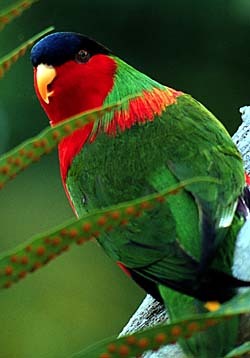 It's covered with mountains and lush tropical foliage. My host hotel was the charmingly simple Matava Resort, an ECO resort, located very close to the Great Astrolabe Reef. As an ECO (Explore, Conserve, Observe) resort the lighting is provided by solar power and hurricane lanterns, with hot water provided by solar or gas heating. The rooms are basic but meet all your requirements... spacious, with mosquito netting, private bath and a spectacular view. My room, just completed in time for my arrival, had a wooden deck for ocean views. Though furnished relatively simply, it was perfect for my needs. MATAVA RESORT - Full of traditional charm, Matava Resort is an enjoyable little island gem. The staff is fantastic. With the help of their organic garden, they have wonderful fresh fruits and vegetables to complement their meals. Another treat were the fresh-baked rolls each morning. The resort offers fishing trips, a comfortable dive boat for 6 or 8 guests (backwards roll entry), snorkeling, kayak trips including an overnight option, waterfall walks, bird watching and village mekes (ceremonial parties). For those seeking a small, intimate and charming Fijian experience, I can heartily recommend Matava Resort. MANTA RAY REEF - Our first dive was to be Manta Ray Reef. Unfortunately we were not lucky enough to see the mantas, but those diving this site both the day before and after told their tales. On average, at this site, they report manta rays about 70% of the time, year round. Visibility was relatively poor for this site, but had there been mantas it would have been worthwhile. The Kadavu diving offers an array of hard and soft corals, clown fish in giant carpet anemones, sharks, rays, octopi, eels, and more. MATANA/DIVE KADAVU RESORT - Next stop, also on Kadavu, was Matana/Dive Kadavu. At first when the boat arrives it appears to be small and intimate like Matava but you soon learn that it's quite a bit larger. Fortunately, it was very cautiously around the vegetation to preserve the island ambiance. The resort offers comfortable accommodations for the dedicated diver. The dining room is set up with multiple long tables, most meals are served buffet style, and the ambiance is very traditional with tappa cloth lighting fixtures and piped in island music. The resort has an on site dive shop, comfortable catamaran style dive boats with overhead dry storage, knowledgeable dive staff and close in dive sites. Room types at Matana/Dive Kadavu vary from double rooms with basic amenities to two bedroom beachfront units with living area. A truly dedicated divers resort they offer lockable wire mesh dive storage on the porch of the units for quick drying of gear. Bring along your own lock if you feel the need. THE PEARL at BEQA LAGOON - My next stop was Beqa Lagoon, off the main island of Vita Levu. There I stayed at The Pearl, a newly remodeled resort in Pacific Harbour. Formerly the Pacific Harbour Resort, this upscale property offers a sleek modern feel in the lobby, common areas, restaurant and rooms. Sitting areas abound in this modern marvel with lounge couches everywhere, in their club, outside the restaurant and the lobby area, hammocks on the beach, pool lounges around the large pool area and a lookout area on the water. There is never a lack of place to relax. AQUA TREK DIVERS - In house at The Pearl is the well-known dive operator, Aqua Trek. This full service dive facility, sister to the Taveuni shop at Garden Island Resort, offers a full range of dive rental gear, storage facility for gear and comfortable boats with overhead dry storage and ample space to spread out. A well-organized and highly-professional operation, Aqua Trek serves an interesting array of dive sites in and around the Pacific Harbour/Beqa Lagoon area. BEQA LAGOON DIVING - Diving in Beqa Lagoon offers bommies (coral heads) abundant with marine life including a variety of hard and soft corals, carpet anemones, clown fish, nudibranchs, bubble coral and a wreck dive, as well as a shark feed, for some variety. During the November - December time frame the shark encounter dive is renamed the big fish encounter because this is the mating season for bull sharks. Even though I visited during this time I was fortunate to see a couple of good-sized bull sharks, grey reef sharks and even an impressive 15-foot Tiger Shark. Wow! TAVEUNI the GARDEN ISLAND - The next portion of my journey was to Taveuni. Aptly named the "Garden Island," Taveuni offers a variety of flora and fauna, some of which is not found elsewhere in the islands. The garden-like setting starts with the airport and follows throughout the entire island. In addition to diving, Taveuni also offers, waterfalls, volcano tours, spa treatments, village tours and even horseback riding. Some of the lodging options in this area offer a true idyllic paradise. I stayed at the romantic and upscale Maravu Resort. The garden setting and beautifully appointed bures (bungalows) are so spectacular you don't mind the 3-minute walk to the beach. Although lacking an in-house dive operator, Maravu pairs wonderfully with Swiss Fiji Diving to offer guests upscale, comfortable and top quality diving services. MARAVU RESORT - If you seek a romantic atmosphere paired with fine food, beautiful vegetation, comfortably appointed upscale lodging, Maravu Resort is a great place to enjoy and relax on a honeymoon, special occasion, or just a respite from your everyday reality. Spa treatments, village tours to the Qeleni Village, hiking, and hammocks all add to the overall enjoyment of the resort. Once each week they offer a traditional Meke with the Qeleni Village children, who are enormously talented. During this Fiji trip, I saw a total of five mekes. This one, put on by the village with the local children, was the most enjoyable. SWISS FIJI DIVERS - Only a three-minute walk down the hill from Maravu Resort, Swiss Fiji Divers is located on the beach closest to the resort. 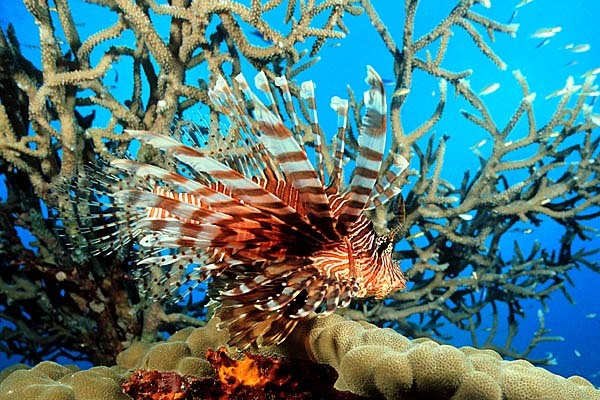 They offer daily dive trips to famed Rainbow Reef, which is less than a 30-minute ride from the dive shop. They have two boats, each with overhead mesh storage to keep items dry. A small, comfortable operation, they serve an average of only 10-12 divers per day. They provide a surface interval on land, at a private stretch of land off Vanua Levu, with hot tea, coffee, a variety of cookies, and the wonderful local fresh fruits. The dive shop handles all the gear from arrival to departure, which can easily spoil you. Drop off your gear at their storage facility upon arrival and from there you'll find it's on your boat, put together and ready to dive each day. Upon return to the shop it is washed, hung up to dry and the process begins anew the following day. Should one need it, they also have top of the line rental gear available. 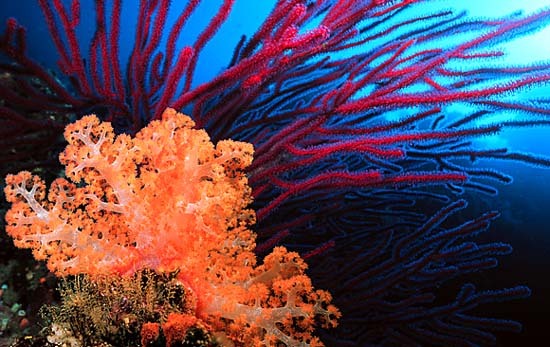 SOFT CORAL PARADISE - Taveuni diving is renowned for its abundant soft corals. There is every size, shape and color of soft coral imaginable, with a variety of marine life added for extra enjoyment. In addition to all that color, I saw grey reef sharks, lionfish, nudibranchs, eels, carpet anemones with anemone fish of all sizes, and a huge population of Christmas Tree worms all on one coral head. The water at Taveuni was about two degrees cooler than in the more southerly islands. There is also an occasional thermocline, which dramatically alters the feel of the dive. Tavenuni diving is also a bit more challenging, as there are occasionally some strong currents with which to contend. MATAGI ISLAND - From Taveuni, I was off to Matangi Island Resort on the private island of Matagi. (The island is spelled without the "n" but the resort is spelled with it to make it easier for guests to pronounce.) From Taveuni it is a ride of about 20 minutes by car plus another 25 minutes by boat to Matangi Island Resort. This island has a magical feel to it that should not be missed. I repeated this resort, the only one of the trip, from my last visit since I was told how much it had changed in recent years. MATANGI ISLAND RESORT - The Douglas family, owners of the resort, has always done well to predict the trend for travel and provide it for their guests. The resort still maintains a special, quiet and secluded garden paradise atmosphere but definitely caters to an upscale diver's needs. The units are all spacious and decorated with mix of furnishings made by local craftsmen. They combine local materials with sleek modern bath fixtures from Australia, plush cushions and windows to view the ocean and take advantage of the breeze. My Treehouse Room offered a king-size bed complete with mosquito netting, sitting area with coffee/tea making facilities, cookies for mid afternoon or midnight snack, mini fridge, an outdoor shower (with full privacy) and a connecting outdoor Jacuzzi tub on a separate deck. TOPSIDE TOURS - Matangi Resort offers Bouma waterfalls and Qamea Village tours to guests, each offered once on a weekly basis, hiking, picnic lunches to famed Horseshoe Bay, kayaking and windsurfing. All these activities are included in the cost of your package. In addition you can enjoy spa treatments, boat tours and fishing excursions and charge it to your room. The staff is eager to help you plan your day with activities and they do an excellent job of making you feel welcome. You can't go wrong with a visit to Matangi Island Resort. THE BOTTOM LINE - Fiji is a unique destination that is very enjoyable for that special occasion... a treat for you, a romantic getaway or a dive trip extraordinaire. Fijians are incredibly friendly and want you to enjoy your trip as much as possible. You will find that the food, hospitality and the ambiance make it a truly spectacular holiday. Visit soon and see for yourself the magic of Fiji! The Fiji Visitors Bureau is also an excellent source of information. They have an office in Los Angeles, which can be accessed via a toll free call to (800) 932-3454. Beyond these resources, Island Dreams has dedicated color brochures for all of the hotels and resorts mentioned in this report. You are invited to call or e-mail for additional information, considered advice, or assistance with resort bookings and discount airfares. Enjoy Fiji....BULA! !